Home » More News » Big changes to the Library's north lawn! In Fall, 2016, the Library's north entrance was closed for the first phase of a renovation project of the north lawn. The existing walkway was removed and a new walkway and pergolas were installed. The project's second phase began in March, 2017, and included outdoor seating areas, a small amphitheater, and additional parking stalls. 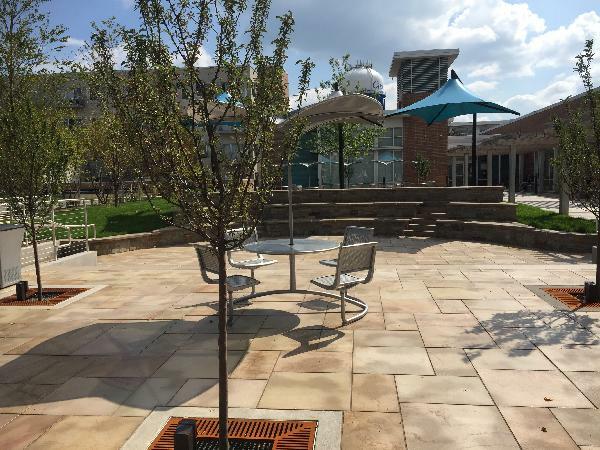 The new Ladish Foundation Plaza was dedicated on September 10, 2017. THANK YOU to the Ladish Foundation for their generous support of this project! Stop by the Library to check out the new look!